Silk protein–based materials show promise for application as biomaterials for tissue engineering. The simple and rapid photochemical modification of silk protein–based materials composed of either Bombyx mori silkworm silk or engineered spider silk proteins (eADF4(C16)) is reported. Radicals formed on the silk-based materials initiate the polymerization of monomers (acrylic acid, methacrylic acid, or allylamine) which functionalize the surface of the silk materials with poly(acrylic acid) (PAA), poly(methacrylic acid) (PMAA), or poly(allylamine) (PAAm). To demonstrate potential applications of this type of modification, the polymer-modified silks are mineralized. 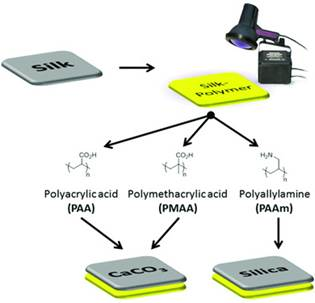 The PAA- and PMAA-functionalized silks are mineralized with calcium carbonate, whereas the PAAm-functionalized silks are mineralized with silica, both of which provide a coating on the materials that may be useful for bone tissue engineering, which will be the subject of future investigations.